Unlike most New York State Parks, Monroe County parks are free. Take advantage of 12,000 acres of natural, zoological, horticultural, historical and geological experiences! It’s an amazing backyard! The 20 parks below are listed in order of their size. Highlights: 2,500 acres of woodlands, ponds, wetlands and glacially created landforms, on the National Registry of Natural Landmarks due to its geologic history and presence of significant kames, eskers, and kettles, Wild Wings, birdsong trail among other excellent hiking trails with varying degrees of difficulty, sledding, camping for scout and youth groups only. Highlights: 1,505-acres, 5 hiking trails with varying degrees of difficulty, sledding. Highlights: 977 acres, arboretum, swimming beach on Lake Ontario, steep wooded slopes and valleys, small lakes, sledding, golf, 5 hiking trails with varying degrees of difficulty. Highlights: 973 acres, Springdale Farm, downhill ski slope (ski lessons from Swain), a model airplane field, 5 hiking trails with varying degrees of difficulty. Skiing around Rochester is as much winter recreation as it is a social experience, competition, and a tradition. A few of these destinations also offer cross country ski rentals. Highlights: 800 acres, Olmsted-designed park, intersection of the Erie Canal and Genesee River, connection point for the Canalway Trail, Genesee Riverway Trail, and Genesee Valley Greenway, 2 golf courses, organized recreation, paved pathways popular with bicyclists and joggers, kayak & canoe rentals. Highlights: 577 acres, located along the Erie Canal, one of two Monroe County parks with a dog park, 4 hiking trails all mainly easy/level. Highlights: 550 acres, the only County park with camping available to families and not just scout troops, sledding, access to Lake Ontario (no swimming), hiking trails. Highlights: 461-acres, exceptional trout fishing from both banks along Oatka Creek, mostly undeveloped, hiking trails with varying degrees of difficulty. Highlights: 447 acres, our first county park, natural woodlands combined with steep slopes, in the Irondequoit Creek flood plain. One of two Monroe County parks with a dog park, one of three with an outdoor ice skating rink, 5 trails with varying degrees of difficulty. Highlights: 380 acres, fish hatchery, steep hillsides, creekside meadows and wetlands, downhill skiing, trout fishing in Irondequoit Creek, 5 hiking trails with varying degrees of difficulty including the Daffodil Trail, winter ski lessons from Swain. Highlights: 348 acres, located on the north side of Ellison Park, marsh area for canoe and kayak access to the bay, hiking trails with varying degrees of difficulty. Highlights: 297 acres, linear park along the Genesee River, Olmsted-designed park, Seneca Park Zoo, pedestrian bridge over river connecting to Maplewood Park and the Genesee Riverway Trail, 6 hiking trails with varying degrees of difficulty. Highlights: 150 acres, Olmsted-designed park, arboretum, Lilac Fest, Lamberton Conservatory, Warner Castle Sunken Garden, Vietnam Veterans Memorial, reservoir, Highland Bowl, , one of three Monroe County Parks with an outdoor ice skating rink, paved pathways with sizable changes in elevation, one of the 5 pre-historic Pinnacle Hills: Cobb’s, Pinnacle, Highland and Mount Hope, plus Oak Hill which is now the University of Rochester’s campus. Highlights: 15 mile linear park, hard packed gravel, crosses the Genesee River to connect with the Genesee Valley Greenway, the only one of our Monroe County Parks utilizing an old railroad line. There are dozens of access points, most at crossroads. Highlights: 182 acres, on Irondequoit Bay, hiking trails are each less than a mile with varying degrees of difficulty. Highlights: 147 acres, completely undeveloped, 2,000 feet of Irondequoit Bay shoreline that is incredibly popular but difficult to park. Highlights: 82 undeveloped acres, west-side of Irondequoit Creek, Lucien Morin runs on the east-side, popular for mountain biking and dog walking. Highlights: 39 acres, historic 1905 Dentzel Carousel, walkable pier, Charlotte-Genesee Lighthouse, restaurants, original Abbots Custard, swimming beach on Lake Ontario, concerts, organized recreation, events, a short walk from the Rochester’s hidden sidewalk. 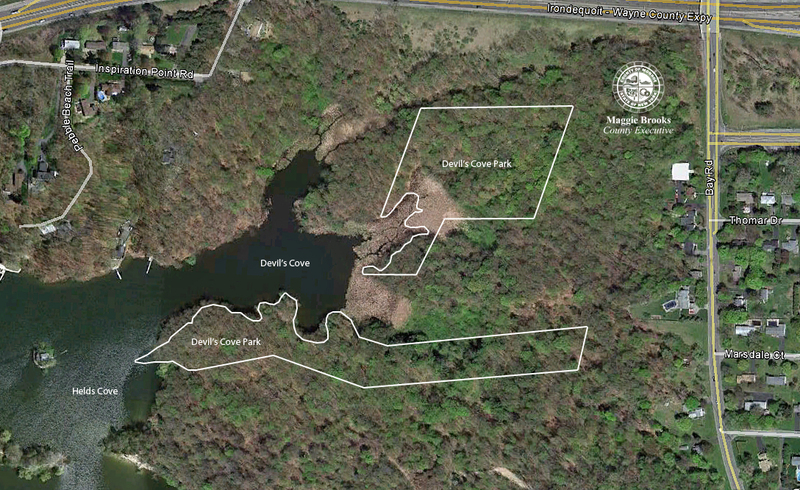 Highlights: 18 acres, park will remain natural and undeveloped, is accessible only from the water. Note: This map shows all of the Monroe County parks. It lists 21 parks because Irondequoit Bay Marine by Seabreeze was recently transferred to the state to manage. Which are your favorite Monroe County Parks?